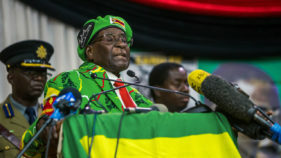 Zimbabwe’s ruling ZANU-PF party will launch the parliamentary process on Tuesday for impeaching President Robert Mugabe, a government lawmaker told AFP. The decision on Monday came after Mugabe missed a deadline to resign given to him by his party over the weekend. “We are expecting the motion to be over (Tuesday),” said ZANU-PF lawmaker Paul Mangwana, referring to the initial procedure to commence impeachment proceedings. He added that ZANU-PF had approached the main opposition Movement for Democratic Change (MDC) party to seek their cooperation to pass the necessary parliamentary votes. In a televised address late Sunday, the 93-year-old veteran leader defied expectations he would quit, pitching the country into a second week of political crisis. The speech provoked anger and disbelief among many Zimbabweans, fuelling concerns that Mugabe could face a violent backlash. Zimbabwe’s crisis erupted on November 13 after a factional squabble over the presidential succession erupted into the open prompting the army to seize power.